After being admitted to the hospital for a week, Dilip Kumar, showed considerable improvement. Dilip, who struggled with dehydration, kidney dysfunction and urinary tract infection, was discharged on August 9. 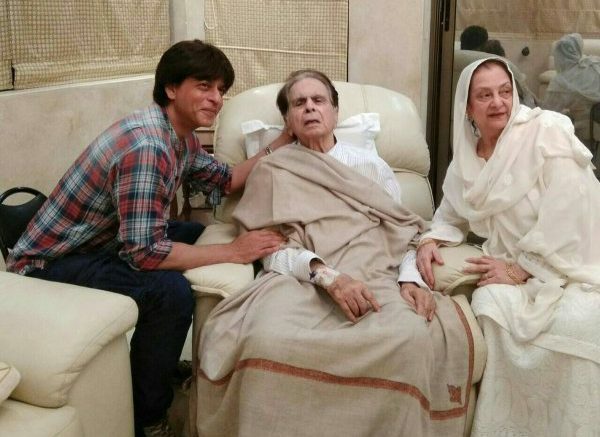 Legendary actor Dilip Kumar’s health became a matter of concern for not only his fans and family but also for his ‘mooh-bola beta’, Shah Rukh Khan. The Jab Harry Met Sejal actor visited the 94-year-old veteran actor at his residence on Tuesday. As the photos of his visit were shared by Dilip Kumar’s wife, Saira Banu on Twitter, Shah Rukh’s love and affection towards the superstar of 1960s was much evident. He also planted a soft kiss on the forehead of the iconic actor who has been dealing with old age complications for a long time now. Sharing the photos, Saira Banu wrote, “Message from Saira Banu: Sahab’s mooh-bola beta-“son” @iamsrk visited Sahab today. Sharing some photos of the evening.” Also, the actor updated the fans of Dilip Kumar about his health as she tweeted, “2/ @iamsrk visited Sahab this evening. Sahab’s doing much better since return from the hospital. Shukar Allah.” Though in the photos, the Ram Aur Shyam actor still seems under the weather. Be the first to comment on "Shah Rukh Khan visits Dilip Kumar, shower love on the iconic actor. See photos"